We absolutely love Italian markets. From Philadelphia to Siracusa to Rome, there is nothing better than the hustle and bustle of purchasing fresh produce, fish, bread, olive oil, prosciutto, and cheese from knowledgeable folks who have been doing it for years and years. As such, we were a little disappointed when we went to Campo di Fiori market in Rome and found it overrun with stands catering mainly to tourists seeking weird dried spice mixes (“Taco Spice”, “Aphrodisiac Romance Spice,””Pasta Spice” etc.). Not exactly what we wanted. Yet relief awaits. Just cross the Tiber river, to the Testaccio neighborhood. It’s full of old buildings and quaint cafes, along with beautiful churches tucked into hidden courtyards. Testaccio is also home to one of M’s favorite Roman sites – the Pyramid of Cestius – as well as the nearly 100 year-old Testaccio Market. Right away we could tell that this place wasn’t designed for tourists. The Testaccio market was the real deal. 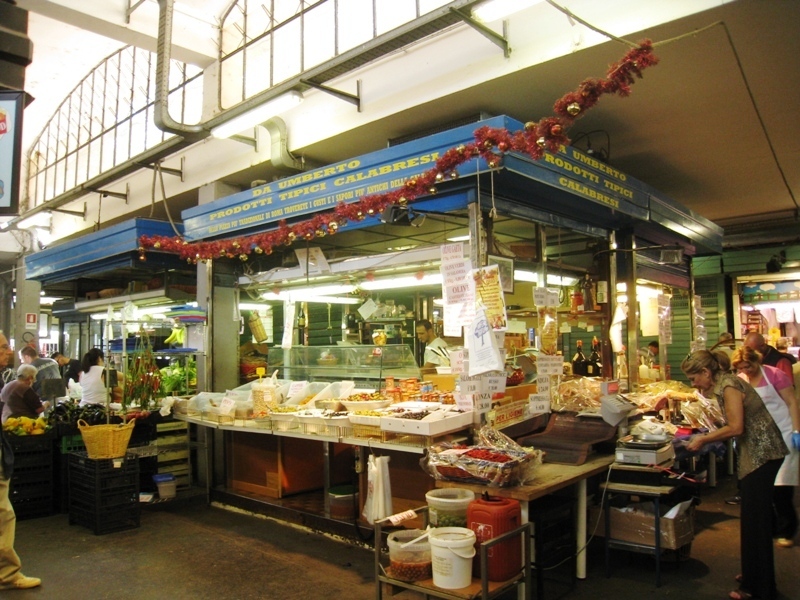 It makes its home in a partially enclosed structure with huge glass skylights, containing vendors selling any kind of delicious item, from meat to bread to veggies. The market was crowded, even at the afternoon hour, and was full of locals chatting and haggling. We spotted tourists, too, but the market certainly wasn’t geared to tourist tastes. One of our favorite stalls was dedicated completely to tomatoes – manned by a kind Sicilian woman who let us sample a few of tomatoes (you can find a few of the varieties below). We also ended up buying arugula, bread, cheese, and some prosciutto all to make a little picnic in the Borghese Gardens. 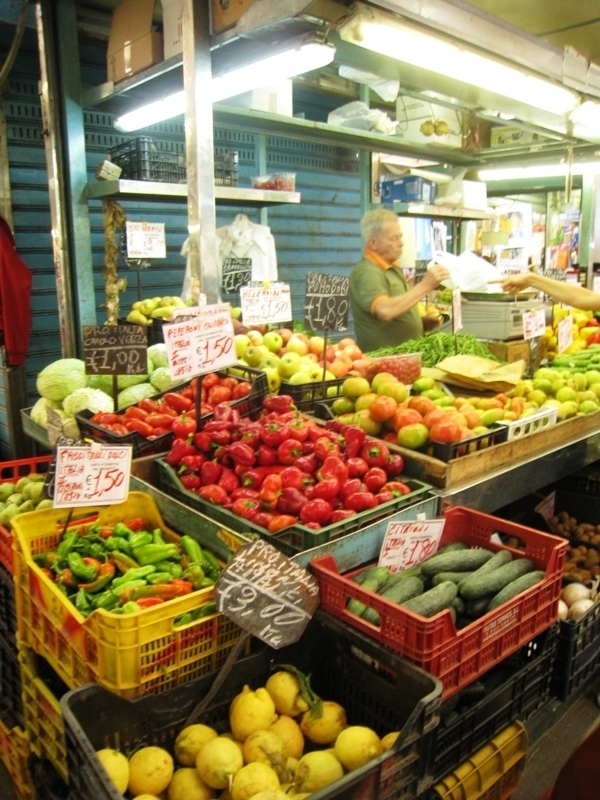 Sadly, we recently learned that Testaccio Market will only live in its current state until the end of the month. Parla Food give a particularly bleak outlook for the market’s future: moved to a new building, the new market is ugly, built on a parking garage, and worst of all, will charge nearly double for vendor space. Seasoned vendors will probably close up shop instead of pass the expense onto their regular customers, meaning the market could soon morph into another tourist trap like Campo de Fiori. Sounds like a lose-lose situation. Really, since when are Romans known to visit the marketplace by car? Much like the Maxwell St. Market in Chicago, we are sure something will be lost in the move. RIP Testaccio Market. So one of the things we were most looking forward to in Italy was getting some good pizza (cliché we know). 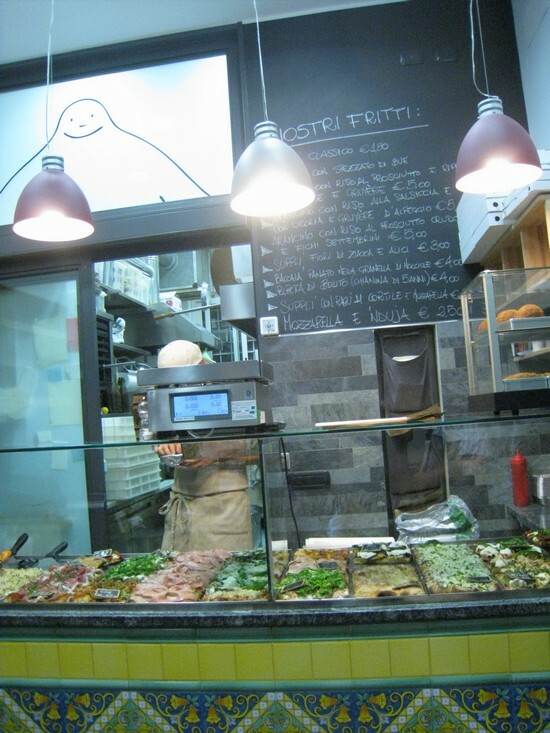 When scanning through the blogosphere for delicious places to eat on the cheap in Rome, we came across many glowing reviews of Pizzarium, so when knew we absolutely had to get there. Pizzarium is helmed by Gabriele Bonci, who is known for his bread and pizza know-how (and who was recently featured in the Atlantic). Pizzarium itself is a tiny, bright store, with nothing in the way of seating or much counter space (we ended up eating our pizza on the curb). However, this tight space is only a minor inconvenience. When we arrived at the tiny Pizzarium we were stunned by the sheer variety crammed into a single tiny glass counter. On that day, there were about 15 varieties of pizza to choose from. Instead of getting pizza by the slice in the way Americans conceive of it, at Pizzarium they serve Pizza al taglio which refers to large, rectangular pizzas that are literally cut with shears/scissors and sold by the kilogram. We tried 3 varieties of pizza: a classical Margherita Pizza (see above), Potato and Ricotta, and spicy Red Pepper Basil. 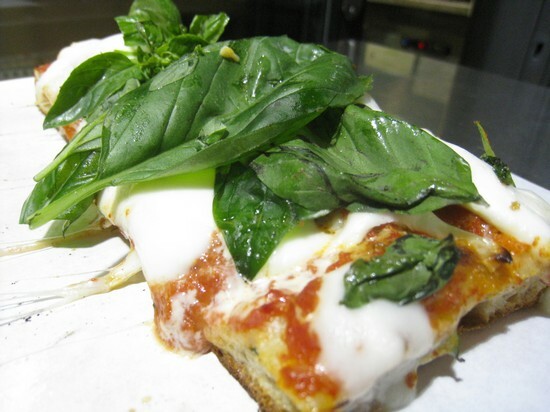 For four slices we spent roughly 15 Euros – which is a pretty good deal for Rome. The crust was phenomenal, and really set the pizza apart from any we had previously. The crust, while not as thick as Sicilian sfincione (more on that later), had a nice thick crust like foccacia bread. We also appreciated the inventive flavor combos and the amazingly fresh ingredients. Pizzarium was the best pizza we sampled in Italy, and is a must do for anyone after (or before) a trip to the Vatican. Who knew that something that only cost 2.50 Euros could be so wonderful. 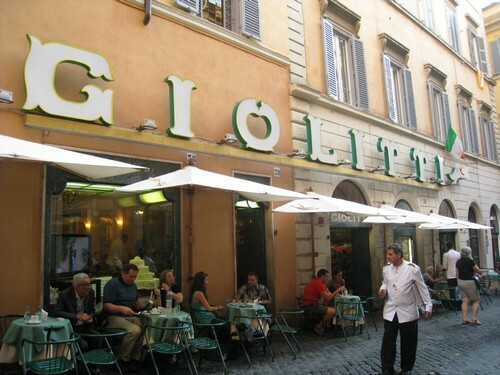 We had our fair share of gelato in Sicily, but nothing could compare to the amazing gelato we got at Giolitti in Rome. Tourists and locals alike fill this place every morning until 1:30 AM, and probably have since its opening in 1900. It became a Roman ritual of ours to get a scoop (or 3) of Giolitti and walk over to the Pantheon, which was a few mere blocks away. Though both of these places were constantly packed to the brim, we never seemed to mind. The ordering process at Giolitti is a little bit different than most shops. You pay at the front cashier and get a receipt with your order. You then take your ticket to the ice cream counter and elbow your way to the front. You tell the scooper what flavors you want – and fast! No time for pondering! If you wanted any evidence of the gluttony present, this is an example of a single scoop. 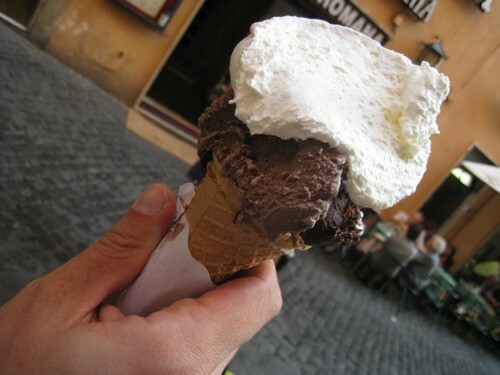 Yes, a single scoop at Giolitti is in fact a triple scoop with a huge dollop of whipped cream on the top. Heaven! 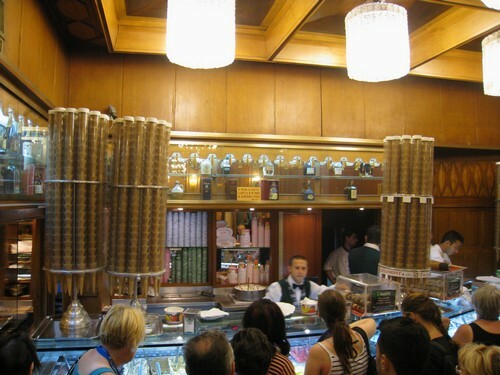 We will never forget our daily trip to Giolitti, and we would be hard pressed to find a better gelato anywhere.